CLICK HERE to purchase a Commerce Card. Can't stop by? Cards can also be purchased here. Interested in accepting the Commerce Card at your businesss? The Champaign County Chamber of Commerce has launched a brand new program aimed to increase local spending. It’s called the Commerce Card. The county-wide gift card program is the only one of its kind. The card is great for holiday and employee gifts and incentives, graduation presents and more. social media pages, radio ads and press releases. 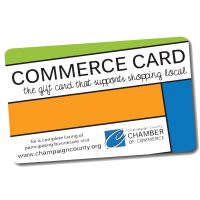 This card is only redeemable at Champaign County businesses, meaning more dollars are being spent locally. Use this opportunity as another way to attract and reach new customers who may not have stopped in your store before. Be a part of an exclusive group of businesses that have access to these customers. Have questions? Contact Lindsay or call 217.359.1791 today.